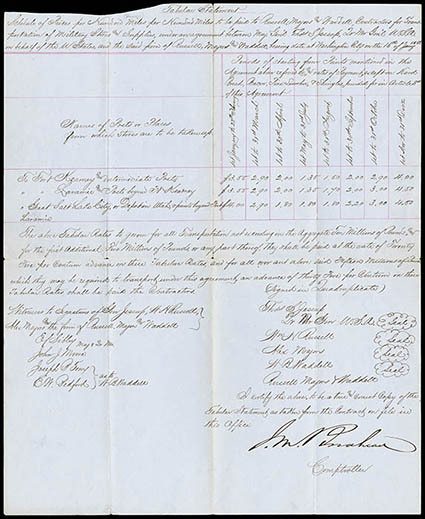 (Russell, Majors and Waddell) Pony Express, 1858 (Jan. 16) Tabular Statement for Military Stores to be Paid to Russell, Majors and Waddell, original handwritten copy of folio-size contract reading "Schedule of Prices per Hundred Pounds per Hundred Miles to be paid to Russell, Majors and Waddell, Contractors for Transportation of Military Stores and Supplies, under arrangement between Maj. Gen'l Thos. S. Jessup, Qr Ms Gen'l U.S.A." and with a tabular listing transportation rates for three routes: "To Fort Kearney and intermediate posts"; "Fort Laramie and posts beyond Ft Kearney"; and "Great Sate Lake City or Depot in Utah, and points beyond Laramie"; some separation along folds, Very Fine. The freighting and staging firm of Russell, Majors and Waddell, formed in 1854 to supply military posts in the American West and Southwest, played a significant role in the history of transportation in the Great Plains. Among the firm's achievements was the creation of the legendary Pony Express. The founding of Russell, Majors and Waddell was rooted in the U.S. Army's need for an efficient means of transporting military supplies between a new depot in Santa Fe and six new army posts in New Mexico Territory, all established at the end of the Mexican War in 1848. In 1854 the War Department decided the best way to efficiently supply these and other posts would be to award two-year contracts to private freighting companies. The quartermaster awarded the first of these contracts to the firm of Russell, Majors and Waddell, a partnership of William H. Russell, Alexander Majors, and William B. Waddell, headquartered in Leavenworth, Kansas. They also transported civilian freight on a large scale. 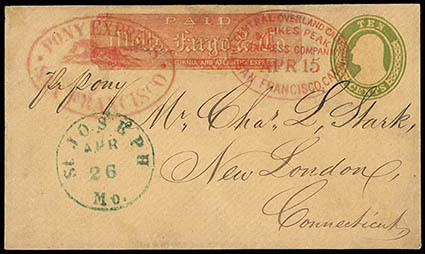 Pony Express, San Francisco, red Running Pony oval handstamp along with matching "Central Overland California & Pike's Peak Express Company, San Francisco, Cal." red oval handstamp canceling 10¢ green (U18) rebacked front with red Wells, Fargo & Co. printed frank addressed to New London, Conn., endorsed "Pr Pony", clear strike of green "St. Joseph, Mo., Apr. 26" cds; the indicia and most of the printed frank have been replaced with portions of the markings expertly drawn in, Very Fine appearance. 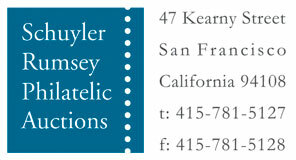 ONE OF THE FEW USAGES WITH THE PONY MARKINGS IN RED, A GORGEOUS USE.